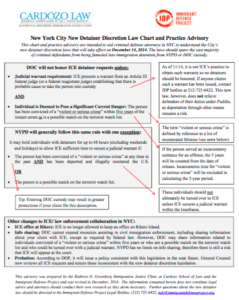 On October 22, 2014 the New York City Council passed groundbreaking legislation dramatically expanding existing city laws that limit the circumstances under which the New York City Police Department (NYPD) and Department of Correction (DOC) will honor an U.S. Immigration and Customs Enforcement (ICE) detainer or otherwise cooperate with federal mass deportation programs. Most of the legislation took effect on December 14, 2014, and ICE’s office on Rikers Island was officially closed down on February 14, 2015. The Immigrant Defense Project and Cardozo School of Law have created an updated advisory, including details about the legislation and the impact of the Obama Administration’s November announcement of the replacement of S-Comm with the Priority Enforcement Program (PEP).